The cross country and stadium jumps are located in Lovettsville, VA at TRU Liberty Farm, owned and operated by Ashley Russell. All jumps are in a seven acre field that is enclosed by three board fence with well drained, mowed grass footing. Use of the jumps is free and Ashley is providing open cross country schooling on the dates listed below and also by special appointment. Unless part of a TSRC scheduled lesson held at Tru Liberty Farm, all members are required to contact Ashley directly to reserve a schooling date. Ashley has also made available her outdoor, all weather bluestone/sand ring and turf dressage ring to ship-ins for $10 per horse. To make arrangements to use these facilities reserve this with Ashley directly. Please reserve your visit by contacting Ashley Russell at 703-362-6325 or ashley@truliberty.com no later than the evening before. If she doesn’t hear from anyone she will assume no one is coming and turn horses out in the field. Use the buddy system or bring a ground person. If you are a TSRC member in good standing there is no fee to use jumps in cross country field. There is a $10 ship in fee for using the bluestone or grass dressage rings. If not a member, the ship-in fee of $10 prevails and is payable to Tru Liberty Farm. Do not use the facility if the ground is too wet and the footing is unsafe. TSRC will not make reservations for your visit. You must wear approved helmet, safety vest, heeled shoes and emergency armband while mounted in the cross country field. Vests are not required for dressage schooling. Before riding you must sign a Tru Liberty waiver (available on your first visit). 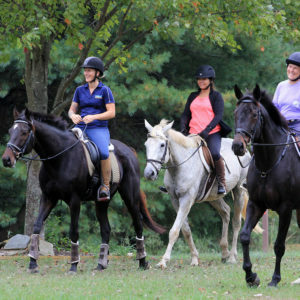 You may ride in the cross country field or trail ride around perimeter of farm. Do not ride in fields with loose horses. Please stay off of lawns near the house. You may use the wash stall or outside hoses. Leave it clean, hoses rolled and tidy. Clean up after your horse. Leave jumps reasonably set up for the next person.